More than 700 people came to South Shore Cultural Center on Sunday, July 29 to view the FREE inaugural performance of Chicago Shakespeare in the Parks: The Taming of the Shrew. The event included a green show featuring Joel Hall Dancers and Soul and Duende Spanish American Theater, with welcoming remarks given by program partner representatives Barbara Gaines of Chicago Shakespeare Theater, Mike Kelly of Chicago Park District, and Nora Moreno Cargie of The Boeing Company. Parks to be visited through Aug. 19 includeTuley, Dvorak, Austin Town Hall, Humboldt, Douglas, Gateway (Navy Pier), Welles, Garfield Park Conservatory, Ridge, and Frank J. Wilson Park. For more information on these FREE performances, visit www.chicagoshakes.com/parks. 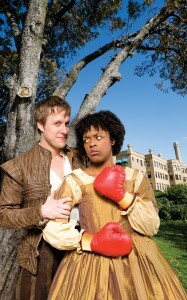 Bianca (Tiffany Yvonne Cox) is tutored by two suitors, Hortensio (L: Matthew Sherbach) and Lucentio (R: Jarrod Zimmerman) in the Chicago Shakespeare in the Parks production of The Taming of the Shrew, adapted and directed by Rachel Rockwell, touring July 29–August 19 throughout the Chicago Park District. Baptista Minola (Robert Joseph Miller) pronounces a match between his daughter Katherina (Ericka Ratcliff) and Petruchio (Matt Mueller) as Gremio (Mick Weber ) looks on in the Chicago Shakespeare in the Parks production of The Taming of the Shrew, adapted and directed by Rachel Rockwell, touring July 29–August 19 throughout the Chicago Park District. Petruchio (Matt Mueller) and Katharina (Ericka Ratcliff) in the Chicago Shakespeare in the Parks production of The Taming of the Shrew, adapted and directed by Rachel Rockwell, touring July 29–August 19 throughout the Chicago Park District. A Chicago Shakespeare Theater production.